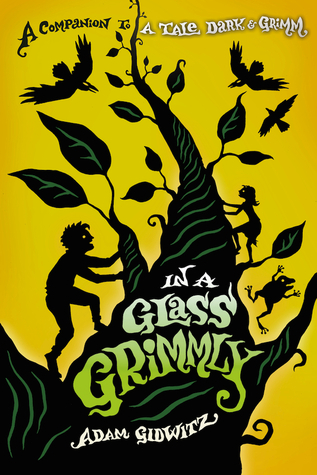 In a Glass Grimmly by Adam Gidwitz. Grades 4-8. Dutton Juvenile, 2012. 314 pages. Review copy provided by my local library. Adam Gidwitz, author of A Tale Dark and Grimm, is back with another bloody, gross, action-packed fairy tale romp. As our intrepid narrator says: "Once upon a time... fairy tales were awesome." This companion book to A Tale Dark and Grimm features cameos from many well-known and little-known fairy tales. Jack and Jill are cousins, each desiring something they can't have. Jack wants to be accepted and become friends with the boys who live in his town, boys who have made fun of Jack for as long as he can remember. Jill desires beauty, or at least her vain mother's approval. Rejected by the ones they care for most, Jack and Jill set off on a quest. And along the way they meet goblins and mermaids and giants and many other fantastical creatures. I liked this one just as much as A Tale Dark and Grimm. It's filled with adventure and I really enjoyed spotting the tales I recognized as they are woven into Jack and Jill's story. Fans of the first book won't be disappointed. This volume also stands quite nicely on its own; the books don't need to be read in order. I read this as part of Angela's Readers' Advisory Challenge for a horror book. While there were definitely some horrible bits, I don't know that I'd classify it as a scary book. Still, this might please some of the kids seeking "scary books", depending on what they're looking for. If horror to them means physical horror (blood & guts, that sort of thing), this will fit the bill. If they're looking for a ghost story, this might be a miss. Obviously, I'd recommend A Tale Dark and Grimm to kids who have enjoyed this book. If they dig the fairy tale angle, I'd try a compilation of the original, gruesome tales like The Complete Grimm's Fairy Tales. There are also lots and lots of retold fairy tales to choose from. Try Breadcrumbs by Anne Ursu, Half Upon a Time by James Riley, or The Grimm Legacy by Polly Shulman. For kids who dig the epic fantasy adventure aspect, I'd recommend another quest fantasy, like maybe The Hobbit by J.R.R. Tolkien, The Lightning Thief by Rick Riordan, or Giants Beware! by Jorge Aguirre. And for kids who like the characters of Jack and Jill and their friendship as they quest, I'd try A Series of Unfortunate Events by Lemony Snickett. In a Glass Grimmly is on shelves now!